A corporate environment includes Exchange Server 2010 SP1 deployed in a primary datacenter and in a secondary datacenter. The datacenters are in separate Active Directory Domain Services (AD DS) sites. Each datacenter includes AD DS domain controllers, Global Catalog servers, DNS servers, and two Mailbox servers. The primary datacenter contains one file share witness. All Mailbox servers are members of one database availability group (DAG). Each datacenter has independent Internet access. A dedicated high-speed network connection exists between the datacenters. You are designing a failover plan. – Provide a highly available solution in the event that the primary datacenter fails. – Provide mailbox access for employees through the secondary datacenter. – Ensure that each Mailbox database is active in only one location at a time. – Ensure that failback to the primary datacenter completes gracefully. C. Enable datacenter activation coordination (DAC) mode before an outage occurs. D. Disable datacenter activation coordination (DAC) mode before an outage occurs. Datacenter Activation Coordination (DAC) mode is a property setting for a database availability group (DAG). DAC mode is disabled by default and should be enabled for all DAGs with two or more members that use continuous replication. DAC mode shouldn’t be enabled for DAGs in third-party replication mode unless specified by the third-party vendor. If a catastrophic failure occurs that affects the DAG (for example, a complete failure of one of the datacenters), DAC mode is used to control the startup database mount behavior of a DAG. When DAC mode isn’t enabled, and a failure occurs that affects multiple servers in the DAG, when a majority of the DAG members are restored after the failure, the DAG will restart and attempt to mount databases. In a multi-datacenter configuration, this behavior could cause split brain syndrome, a condition that occurs when all networks fail, and DAG members can’t receive heartbeat signals from each other. Split brain syndrome can also occur when network connectivity is severed between the datacenters. Split brain syndrome is prevented by always requiring a majority of the DAG members (and in the case of DAGs with an even number of members, the DAG’s witness server) to be available and interacting for the DAG to be operational. When a majority of the members are communicating, the DAG is said to have quorum. For example, consider a scenario where the first datacenter contains two DAG members and the witness server, and the second datacenter contains two other DAG members. If the first datacenter loses power and you activate the DAG in the second datacenter (for example, by activating the alternate witness server in the second datacenter), if the first datacenter is restored without network connectivity to the second datacenter, the active databases within the DAG may enter a split brain condition. How DAC Mode Works DAC mode is designed to prevent split brain from occurring by including a protocol called Datacenter Activation Coordination Protocol (DACP). After a catastrophic failure, when the DAG recovers, it won’t automatically mount databases even though the DAG has a quorum. Instead DACP is used to determine the current state of the DAG and whether Active Manager should attempt to mount the databases. You might think of DAC mode as an application level of quorum for mounting databases. To understand the purpose of DACP and how it works, it’s important to understand the primary scenario it’s intended to deal with. Consider the two-datacenter scenario. Suppose there is a complete power failure in the primary datacenter. In this event, all of the servers and the WAN are down, so the organization makes the decision to activate the standby datacenter. In almost all such recovery scenarios, when power is restored to the primary datacenter, WAN connectivity is typically not immediately restored. This means that the DAG members in the primary datacenter will power up, but they won’t be able to communicate with the DAG members in the activated standby datacenter. The primary datacenter should always contain the majority of the DAG quorum voters, which means that when power is restored, even in the absence of WAN connectivity to the DAG members in the standby datacenter, the DAG members in the primary datacenter have a majority and therefore have quorum. This is a problem because with quorum, these servers may be able to mount their databases, which in turn would cause divergence from the actual active databases that are now mounted in the activated standby datacenter. DACP was created to address this issue. Active Manager stores a bit in memory (either a 0 or a 1) that tells the DAG whether it’s allowed to mount local databases that are assigned as active on the server. When a DAG is running in DAC mode (which would be any DAG with three or more members), each time Active Manager starts up the bit is set to 0, meaning it isn’t allowed to mount databases. Because it’s in DAC mode, the server must try to communicate with all other members of the DAG that it knows to get another DAG member to give it an answer as to whether it can mount local databases that are assigned as active to it. The answer comes in the form of the bit setting for other Active Managers in the DAG. If another server responds that its bit is set to 1, it means servers are allowed to mount databases, so the server starting up sets its bit to 1 and mounts its databases. But when you recover from a primary datacenter power outage where the servers are recovered but WAN connectivity has not been restored, all of the DAG members in the primary datacenter will have a DACP bit value of 0; and therefore none of the servers starting back up in the recovered primary datacenter will mount databases, because none of them can communicate with a DAG member that has a DACP bit value of 1. DAC Mode for DAGs with Two Members DAGs with two members have inherent limitations that prevent the DACP bit alone from fully protecting against application-level split brain syndrome. For DAGs with only two members, DAC mode also uses the boot time of the DAG’s alternate witness server to determine whether it can mount databases on startup. The boot time of the alternate witness server is compared to the time when the DACP bit was set to 1. If the time the DACP bit was set is earlier than the boot time of the alternate witness server, the system assumes that the DAG member and witness server were rebooted at the same time (perhaps because of power loss in the primary datacenter), and the DAG member isn’t permitted to mount databases. If the time that the DACP bit was set is more recent than the boot time of the alternate witness server, the system assumes that the DAG member was rebooted for some other reason (perhaps a scheduled outage in which maintenance was performed or perhaps a system crash or power loss isolated to the DAG member), and the DAG member is permitted to mount databases. Because the alternate witness server’s boot time is used to determine whether a DAG member can mount its active databases on startup, you should never restart the alternate witness server and the sole DAG member at the same time. Doing so may leave the DAG member in a state where it cannot mount databases on startup. If this happens, you must run the Restore-DatabaseAvailabilityGroup cmdlet on the DAG. This resets the DACP bit and permits the DAG member to mount databases. Other Benefits of DAC Mode In addition to preventing split brain syndrome at the application level, DAC mode also enables the use of the built-in site resilience cmdlets used to perform datacenter switchovers. These include the following: Stop- DatabaseAvailabilityGroup Restore-DatabaseAvailabilityGroup Start- DatabaseAvailabilityGroup Performing a datacenter switchover for DAGs that are not in DAC mode involves using a combination of Exchange tools and cluster management tools. For more information about datacenter switchovers, see Datacenter Switchovers. Enabling DAC Mode DAC mode can be enabled only by using the Exchange Management Shell. Specifically, you can use the Set-DatabaseAvailabilityGroup cmdlet to enable and disable DAC mode, as illustrated in the following example. Set-DatabaseAvailabilityGroup -Identity DAG2 -DatacenterActivationMode DagOnly In the preceding example, a DAG named DAG2 is enabled for DAC mode. For more information about enabling DAC mode, see Configure Database Availability Group Properties and Set-DatabaseAvailabilityGroup. A corporate environment includes Exchange Server 2010 deployed at the company headquarters and at a branch office. Each location includes one Mailbox server, one Client Access server, and one Hub Transport server. Each location has two Edge Transport servers in the perimeter network. The current MX record preferences and Edge Transport servers are shown in the following table. – Balance external email between the headquarters and branch office locations. – Balance email delivered to each location between the location’s Edge Transport servers. Set all MX records to the save preference, means round robin will be done. The environment is configured as shown in the following table. The company is planning to test a complete site failover. – Ensure that users can connect to their mailboxes in the disaster recovery site by using Microsoft Outlook 2010. – Minimize downtime during the site failover. – Minimize client connectivity issues after the site failover. After the site failover, update exchange.contoso.com to point to DR-MBX1. After the site failover, update exchange.contoso.com to point to DR-HTCAS1. C. Add a DNS record pointing exchange.contoso.com to the DR-HTCAS1 server. D. Add a DNS record pointing exchange.contoso.com to the DR-MBX1 server. DNS record must be repointed to another server and TTL is minimized to propagate quicker. A corporate environment includes Exchange Server 2010 and Active Directory Domain Services (AD DS). You need to recommend a solution for preventing a specific group of users from changing their AD DS passwords in Outlook Web App (OWA). Then Policy is applied to a user/group. You can enable or disable the Change Password feature for a single user by configuring the user’s mailbox, or For multiple users by configuring the /owa virtual directory. You can enable or disable the Change Password feature by using segmentation. Segmentation is a method of customization for OWA. With segmentation, an administrator simply controls which components of OWA are visible to the end user. Many enterprises want their users to have access to the full range of functionality through the OWA client. However, some users might require only a limited set of features to complete their daily duties. To configure segmentation right-click the OWA site and select Properties. The Segmentation tab lists the userlevel OWA components that can be toggled on and off for users of the Client Access server. 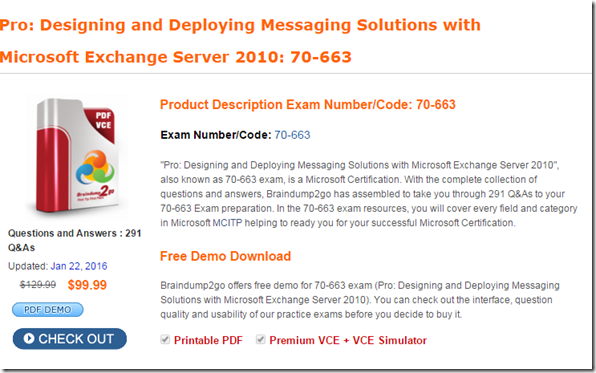 Exchange Server 2010 introduces OWA mailbox policies. These policies allow administrators to apply segmentation selections to individual users or groups of users, rather than to everyone who connects to OWA on a specific Client Access server. Even though the feature includes “mailbox” in its name, these policies are technically not applied to mailboxes but rather to the web application that’s used to access mailbox data. When the Client Access server role is installed, a default OWA mailbox policy is put in place. By default, all the listed, segmentable features are enabled in the default policy. Client computers and the Exchange servers are joined to a single AD DS domain. When users connect to Outlook Web App (OWA) from their client computers, they are prompted for their credentials. You need to recommend a solution that allows users to connect to OWA from their client computers without being prompted for credentials. Two teams of support technicians manage mailboxes for the organization. – The Tier 1 support team must manage mailboxes for all users other than those in the Executive Organizational Unit (OU). – The Tier 2 support team must manage mailboxes for all users in the Executive OU. A. Create an exclusive scope for the Tier 2 support team. B. Create an explicit scope for the Tier 1 support team. C. Create an exclusive scope for the Tier 1 support team. D. Create a configuration scope for the Tier 2 support team. When you create an exclusive scope, only those who are assigned that exclusive scope can modify the objects that match the scope. 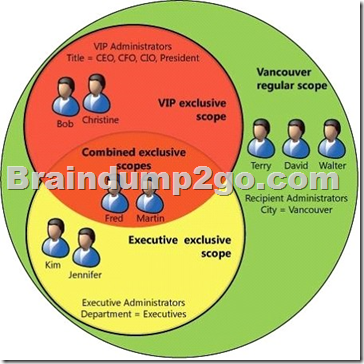 Role assignees who aren’t assigned that exclusive scope, or an equivalent, can’t modify the objects that match the scope, even if their own roles have scopes that would otherwise include the objects. Using scope filters, you can create a scope that matches how you segment your recipients, databases, and servers so that administrators can manage only those objects they should have access to. Scope filters can use nearly any recipient, database, or server object property. A corporate environment includes a main office and a branch office. The company plans to deploy Exchange Server 2010. The Mailbox servers will be part of a single database availability group (DAG) that spans both locations. There is only intermittent connectivity between the two locations. You need to recommend a public folder database solution that enables users from either location to consistently access public folders. B. Configure public folder referrals between the main office and the branch office. D. Configure cross-site RPC Client Access on the DAG. Public Folder replication will be required so a copy exists in both locations. During periods of inactive connectivity between the sites the databases will still be accessible. When the sties come back online the data will replicate and update the copies in either site. After you determine which public folders you want to replicate and the databases on which they will be replicated, you can set the public folder database replication schedule. By default, public folder replication is scheduled to run every 15 minutes. You can select precanned replication intervals, or you can create a custom schedule. A corporate environment includes an on-premise deployment of Exchange Server 2010 SP1 and an Active Directory Domain Services (AD DS) domain. The company plans to move some users to a cloud-based Exchange Server 2010 SP1 environment. – Integrate the on-premise environment with the cloud-based environment. 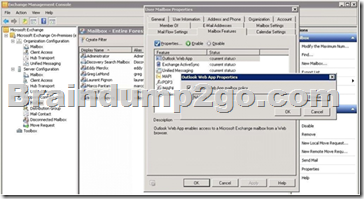 – Migrate all existing mailbox items. 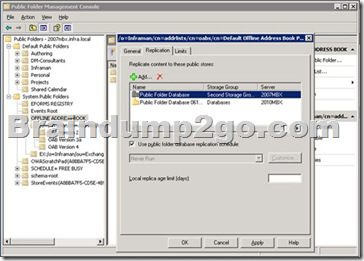 – Authenticate all users by using their AD DS credentials. – Share calendar availability information among all users. You need to recommend a tool for gathering information and verifying that the requirements can be met. The Exchange Server Deployment Assistant is a web-based tool that asks you a few questions about your current environment and then generates a custom step-by-step checklist that will help you deploy Exchange. 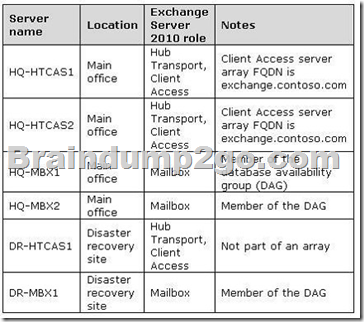 The Exchange Server 2010 Deployment Assistant is available for the following scenarios. All employees connect to their mailboxes by using a web browser. You need to recommend a solution that will force only a specific group of employees to use WebReady Document Viewing when connecting to their mailboxes. 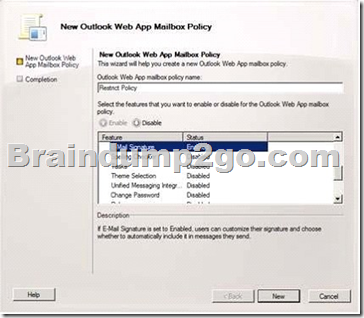 A. Configure an Outlook Web App mailbox policy. B. Configure the Outlook Web App virtual directory on all Client Access servers. where the computer accounts for the employees reside. where the user accounts for the employees reside. WebReady Document Viewing lets users access file attachments in Microsoft Office Outlook Web App. Users can access common file types such as Microsoft Word documents without having the application installed. 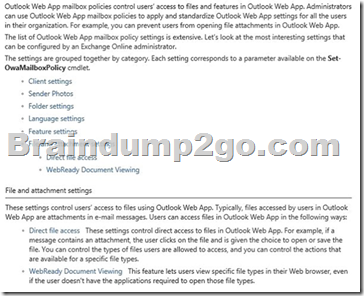 You can manage WebReady Document Viewing for Outlook Web App in Microsoft Exchange Server 2010. When you manage WebReady Document Viewing, you can specify files that you want users to be able to access within Outlook Web App for private and public computers. However, you can’t specify individual settings for only private or public computers. By default, public computer file access isn’t enabled for Outlook Web App. Therefore, when users select the This is a public or shared computer option or the This is a private computer option on the Outlook Web App sign-in page, they won’t be able to access files attached to e-mail messages. A corporate environment includes an on-premise deployment of Exchange Server 2010 SP1. Client computers run Microsoft Outlook 2010. Contractors use a cloud-based Exchange Server 2010 SP1 service and have email accounts on the contractors.contoso.com domain. Employees cannot view calendar availability information for contractors from their client computers. You need to recommend the first step in sharing calendar availability information between employees and contractors. A. Create a sharing policy. C. Create a federation trust. D. Create a forest trust. Establish a federation trust with the Microsoft Federation Gateway and configure organization relationships or sharing policies with other external Exchange organizations including cloud based Exchange.